The report recommends that the small-scale renewable energy scheme (SRES) should be abolished by 2021. It also calls on state governments to fund solar feed-in tariffs through their budgets, rather than through consumers’ energy bills. The ACCC has concluded that offering subsidies for household solar was a well-intentioned but ultimately misguided policy. Solar schemes were too generous, unfairly disadvantaged lower-income households, and failed to adjust to the changing economics of household solar. The lesson for policy-makers is that good policy must keep costs down as Australia navigates the transition to a low-emissions economy in the future. Failure to do this risks losing the support of consumers and voters. Rooftop solar schemes were much more popular than anticipated. This might sound like the sign of a good policy. But in reality it was more like designing a car with an accelerator but no brakes. Generous feed-in tariffs and falling small-scale solar installation costs encouraged more households to install solar than were initially expected. Premium feed-in tariffs were well above what generators were paid for their electricity production. Historically solar feed-in tariffs paid households were between 16c and 60c per kilowatt-hour, while wholesale prices were less than 5c per kWh. At the same time, installation costs for solar panels fell from around A$18,000 for a 1.5kW system in 2007, to around A$5,000 for a 3kW system today. The SRES subsidy for solar installations was not linked to the actual installation cost or the cost above the break-even price. So the SRES became relatively more generous as installation costs fell. As solar penetration increased, and network costs rose to cover this, it became increasingly attractive for households to install solar panels. In Queensland, the initial cost forecast for the solar bonus scheme was A$15 million. Actual payments were more than 20 times that in 2014-15, at A$319 million. And the environmental benefits weren’t big enough to justify that cost, as other policies have reduced emissions at a lower cost. The large-scale renewable energy target reduced emissions for A$32 per tonne, while household solar panels reduced emissions at a cost of more than A$175 per tonne. 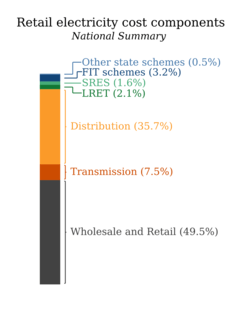 In most states, premium feed-in tariffs and rooftop solar subsidies are funded through higher bills for all consumers. Everyone pays the costs, yet only those with panels receive the benefits. That means the costs fall disproportionately on lower-income households and those who rent rather than own their home. The ACCC report recommends the SRES be wound up nearly 10 years ahead of schedule, because the subsidies are no longer financially justifiable. This would maintain the support for current solar installations but remove subsidies for new solar installations from 2021. The report also recommends removing the direct costs of feed-in tariffs from electricity bills. Instead, state governments should directly cover the costs of premium feed-in tariffs. The Queensland government has already made this move. Of course, governments still have to find the money from elsewhere in their revenues, which means taxpayers are still footing the bill. But the new arrangement would at least remove the current unfair burden on households without solar. How can governments avoid making similar policy mistakes in the future? The ACCC’s recommendations, together with the proposed National Energy Guarantee (NEG), provide a solid foundation for Australia’s future energy policy. First, the future is hard to predict, so good policy adapts to change. The NEG provides a flexible framework to direct energy policy towards a low-emission, high-reliability, low-cost future. Reviewing and adjusting the emissions target along the way will enable Australia’s energy policy to respond to new technologies and shifting cost structures, while maintaining consistency with economy-wide targets. Second, it is hard to pick winners, so good policy creates clear market signals. The NEG provides the energy industry with clear expectations, but is technology-agnostic and minimises government intervention. This encourages the market to find the most cost-effective way to reduce emissions and ensure reliability. The ACCC report also recommends simplifying retail electricity offers, which would make it easier for consumers to find a good deal, and in turn making the market more competitive. Politicians have an opportunity to draw a line in the sand on narrow, technology-specific policies such the SRES. An integrated energy and climate policy should focus on good design, and then step back and let the market pick the winners. 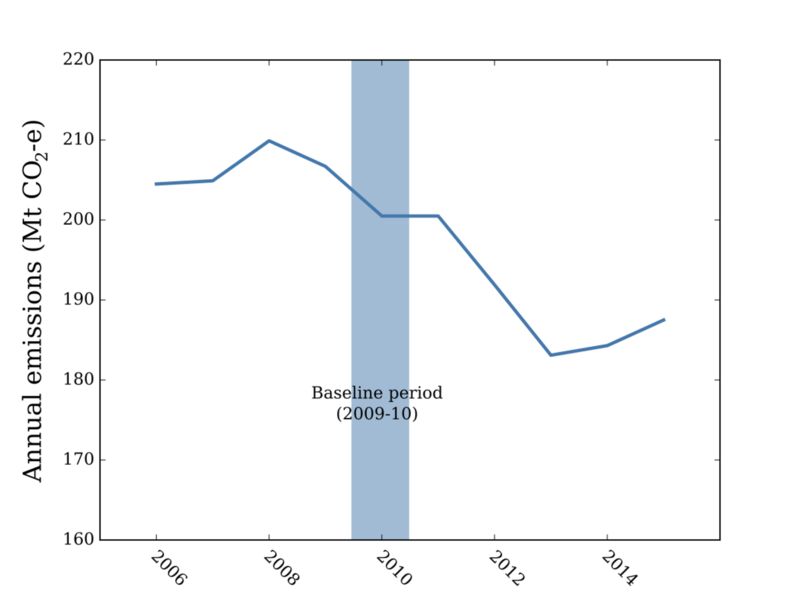 The safeguard is based on the high point in annual emissions from the whole electricity sector between 2009-10 and 2013-14. Generators’ individual baselines and associated penalties only come into play if the whole sector goes over the baseline. The current Renewable Energy Target is a certificate scheme that requires retailers to buy a certain amount of renewable energy. The cost of these certificates is passed on through electricity bills. However, as shown by the government’s own modelling, the interaction with the wholesale market results in a net saving to consumers. Interestingly, and as the AEMC points out, the electricity ETS is designed to be flexible and integrate with a renewable energy target. Indeed, such an ETS could drive investment in renewable energy, replacing current subsidies through the Renewable Energy Target. The 50% target could theoretically be achieved through the ETS alone, if the baseline was set at the right level.